The location is minutes from highways to Asti, to the wine region between Asti and Alba, Torino and other sites. The apartments are pleasantly furnished and spotlessly clean. Linens are high quality. The kitchen is well-appointed, a true gift among apartment kitchens. In other words, all of our travel needs were met. The holiday was made perfect by the hosts' graciousness and the ambience of the casa. We were allowed our privacy; yet, our hosts were like immediate friends. They left baskets of tomatoes and peppers from their garden at our door, gave us a tour of the museum at Castell'Alfero, provided us with a welcoming bottle of wine, home made preserves and a dish of Ferrero Rocher chocolates. Even Tommy, their little dog, greeted us each day with a wagging tail. The old house is lovingly restored and is a charming backdrop for the picnic tables and lounge chairs on the patio. 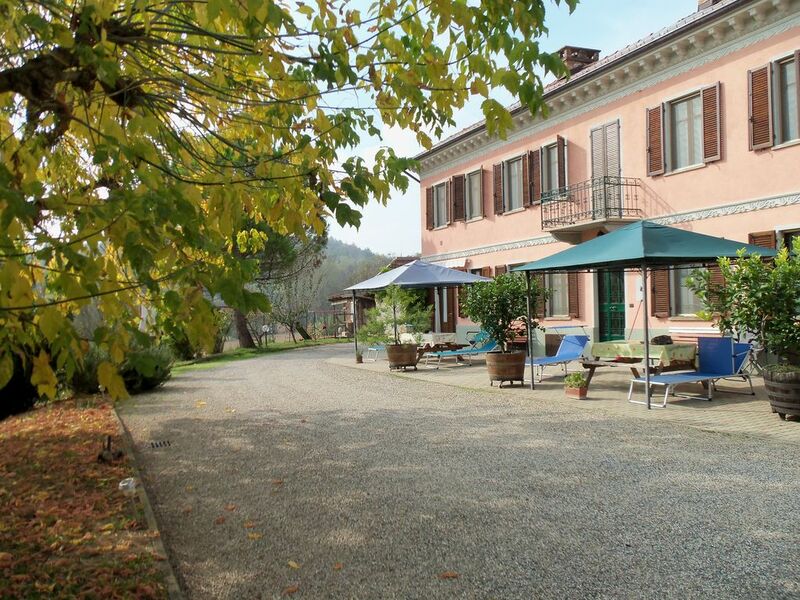 I have already recommended Casa dei Ciliegi to friends. It is like a home away from home. Hosts were like family. The owner gave us a private tour of a nearby castle. Nice open air site. Very clean and comfortable. Minutes from Asti. A couple of hours from Aosta. we have had moments of really interesting cultural exchange. What a wonderful home. It was beautiful and the view fantastic. We were greeted by a wonderful dog. The family was so cordial and the home delightful. We were so close to the wine country and the other delights of the this area. We were very close to Asti as well as a short ride to Lake Como and Lake Maggiore. Had a delightful time in a winery. The family allowed us to use their internet wifi so we could keep up with our family. The home was very clean and very modern the kitchen to die for and also cook in. We wish is was warmer so we could enjoy the beautiful picnic table. It was very close to grocery stores and gas stations. We would recommend this to everyone. Très belle maison dans un super cadre. Accueil très chaleureuse ! Je recommande ! Vi ringrazio per la votra gradita testimonianza e del messaggio che mi avete lasciato nella casa: è stato un vero piacere ospitarVi, siete stati molto discreti ed educati, avete usato l'appartamento con molta cura. Spero di potervi ospitare ancora. (vi chiedo scusa per il mio scarso francese ). We zijn hartelijk ontvangen door de eigenaren, die altijd bereid waren advies, informatie en hulp te bieden en ons verrasten met kleine attenties. In de woning lag ook goede informatie over de omgeving, zoals gedetailleerde fiets- en wandelkaarten. De woning bleek mooier dan wat de foto's hadden laten zien. Het was er ruim, comfortabel, heel schoon en sfeervol. De keuken was uitgebreid voorzien van goede apparatuur. En niet te vergeten: de bedden lagen heerlijk. Een fijn appartement op een prachtige locatie in een mooie en rustige omgeving. We wilden eigenlijk niet weg dus we komen er weer aan! Nous avons passé un très agréable séjour dans cette spacieuse location. Une maison très jolie dans la campagne, paisible, toute proche d'Asti. La location est très propre et bien meublée avec tout le nécessaire, "comme à la maison".L'extérieur de la location dispose d'une terrasse avec de quoi profiter du soleil (tables, chaises, bains de soleil, barbecue,...). Les enfants trouveront également leur bonheur avec des jeux d'extérieur à disposition (toboggan et balançoires) et pourront observer tranquillement les petites chèvres dans l'enclos d'à côté. Les propriétaires sont une charmante famille, pleine d'attentions. Sur place on trouve une documentation variée sur les activités de la région (balades, visites de châteaux, de caves,...) qui est très belle. Nous n'avons vraiment pas été déçus de notre séjour!